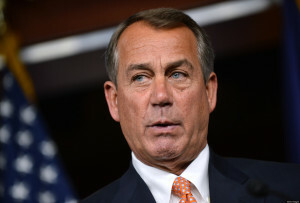 John Boehner the Speaker of the House said during an interview recently published that the U.S. House of Representatives might subpoena the server for the personal email of Hillary Clinton if she were not to turn it over for examination by a third party. The Republican from Ohio said Clinton violated the law and the thought of her using her sever doing official business is against all transparency issues that President Obama enjoys to tout so much. The email used by Clinton had been a topic of interest and speculation since a number of reports in March revealed she used her personal account hosted by a server registered to her home in New York to conduct correspondence while working as the U.S. Secretary of State. That practice potentially is a violation of the federal law, and has brought up questions over why she did so much to keep her email messages off the official system of the U.S. government. Boehner said that at some point it cannot be ignored that there are a number of public documents on that server that the people in the U.S. have the right to view. The Speaker added that he believes it is now time for Clinton to turn the server over with the documents to the country’s inspector general and let them sort out the official mails from the private ones as he said he does not have any interest in reading her private ones. Boehner added he still has not made his final decision about whether or not he will subpoena them, but said all options remained on the table. In addition on Thursday, a House committee that is investigating the terror attack in 2012 on the U.S. consulate in the Libyan city of Benghazi called on Clinton for testimony about the role she played in the response by the Obama administration to the attack during the week of May 18. The committee’s chairman sent Clinton’s attorney a letter that included 100 questions about what the State Dept had known about the use by Clinton of her private email, who set it up and how it had been funded.